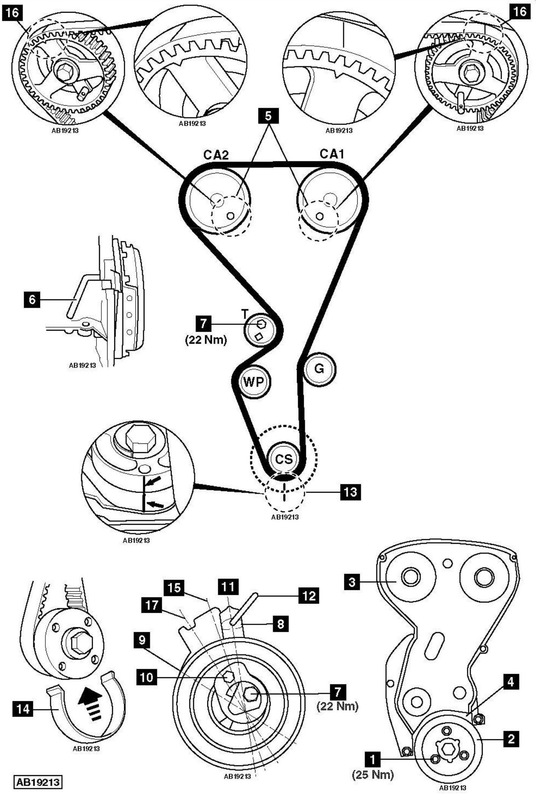 Peugeot 206 1.6 2003 cambelt change instructions and replacement inteval. Full guide! Camshaft timing pin (CA1) – Peugeot No.(-).0132.AJ1. Camshaft timing pin (CA2) – Peugeot No.(-).0132.AJ2. Flywheel timing pin – Peugeot No.(-).0132.QY. Timing belt retaining clip – Peugeot No.(-).0132AK. Upper RH auxiliary drive belt cover. Unclip and reposition RH wiring harness. Unclip AC pipe (if fitted). Push AC pipe to one side. Insert timing pins in camshaft sprockets  . Tool Nos. (-).0132 AJ1/2. Insert timing pin in flywheel  . Tool No.(-).0132.QY. Turn tensioner pulley clockwise until pointer  aligns with position  . Use Allen key  . NOTE: DO NOT turn tensioner pulley 360°. NOTE: Check tensioner pulley, guide pulley and water pump for smooth operation. Replace if necessary. Align tensioner pulley pointer  with position  . NOTE: DO NOT turn tensioner pulley. Insert 3 mm pin  . Fit timing belt. Mark on belt should be aligned with mark on crankshaft  . Secure belt to crankshaft sprocket with retaining clip. Tool No.(-).0132AK  . Fit timing belt to guide pulley. Fit timing belt to camshaft sprocket CA1 then CA2. Remove retaining clip from timing belt  . Remove pin  from tensioner pulley. Turn tensioner pulley anti-clockwise until pointer  reaches maximum position  and then turn tensioner pulley clockwise until pointer moves back 2 mm. Use Allen key  . Tighten tensioner pulley bolt to 22 Nm  . Ensure marks on belt aligned with marks on sprockets  . Insert timing pins  &  . Turn tensioner pulley slowly clockwise until pointer  aligns with position  . Use Allen key  . NOTE: DO NOT allow tensioner to return to position shown  . Check pointer  aligned with position  ±2 mm. If incorrect, repeat above operations. Tighten crankshaft pulley bolts  . Tightening torque: 25 Nm.